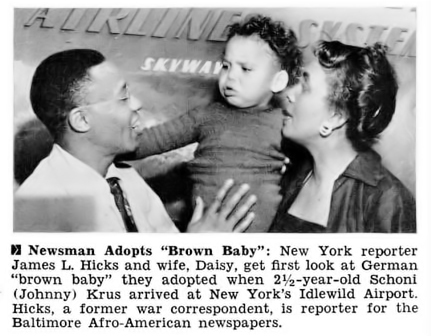 Reporter Jimmie Hicks and Wife Daisy adopt German brown baby interracial child of war. Jet Magazine, June 18, 1953. A great film project entitled: Brown Babies: The Mischilingskinder Story, is playing in select theaters throughout the United States. It is the untold story of the mixed-race/nation children born from the relations between African-American serviceman and German women after World War II. This is the same project mentioned in my earlier blogpost, leading to the link. Although this is not news or stories of “The Pacific,” as my blog topic is about, this story points to the relations between the hierarchies of color, nation, gender, and war trauma’s effects and behaviors–as victorious or defeated, much like the processes that parallel the present formation of social relations in the Pacific. These social relations, born of war and race and nation-building, born of the subjugation of women, born of scorn and memory, sadness and violence, play themselves out similarly around the globe. The specter of color is strong and alive. Who made this order? This story, of African-American/white-German babies born after the Second World War, is also a mostly invisiblized story. The stories told in this great film project, similar to the stories told by the children of African-American/Asian women after US Occupation and/or wars in the Pacific, are hard to tell, both to be silent on our own because of shame and because it re-traumatizes, as well as being silenced by governments and institutions and family members. So these stories cannot remain silent forever. So they are being told. Below is a dramatic trailer for the movie. See and listen to the parallels between these stories and those that have and will continue to dot the mindscape that I put forward in these blogposts throughout. This is not just to feel lament, sadness, anger. Hopefully it will move us to re-think, re-position ourselves, to act with compassion and power, to shift the contours that make this possible. You can visit their website here . Love history this is a must see.